Some of you may already know, but a few days ago my lovely partner Hugh surprised me with this beautiful new bike! My old bike could never handle the hills in the area we live in too well, and after one too many problems getting the breaks to work I decided to play it safe and retire it. So as you can imagine I am extremely excited to start riding again, and having a bike that can actually make it up some of the steep hills in our area makes it even better - not to mention give me quite a work out, which is also appreciated. When it comes to bike riding, the outfit I wear always depends on where we're going. I definitely don't always get dressed up like this to go for a bike ride unless we're going somewhere in particular, such as a nice cafe or restaurant, otherwise I am more than happy to ride in work out gear. Not pictured in these photos is my helmet, although I most certainly do wear one at all times - even if it leaves me with helmet hair. However, I'm working on combating this by wearing a scarf under my helmet, and this way my hair doesn't go all over the place when I speed down the many steep hills in our area. Playsuits are my absolute favorite thing to wear on bike rides for comfort, and obvious practical reasons, so fortunately there are a number of those in my wardrobe and they will all be making an appearance this summer. I love this two piece Tara Starlet set because not only is it extremely flattering, it's also very comfortable. There are a number of sets like this in the sale Tara Starlet have at the moment and I am very tempted...! When it comes to wearing heels while bike riding - this is something that is totally doable. However I prefer to wear chunky platforms or a stumpy kitten heel, something that won't get caught in the pedals the way a higher, thinner heel could. Great post! I recently got a vintage style bike and have been looking for more cycling friendly vintage outfits (I mostly wear dresses/ skirts but wouldn't dream of wearing those whilst cycling so looking for shorts/ pants has been fun.) I look forward to more of your vintage cycling outfits! You look lovely and so does the bike! Well, at least you don't get helmet fringe. :--D Fringes and helmets don't really go together, but now that I finally own a helmet, I just have to wear it.. But I'm looking forward to winter, so I don't have to go around with a flat fringe!!! Adorable bike, and an equally adorable look to go with it. I always have to roll my eyes at people who say you can't ride in heels - it's perfectly safe, and sometimes heels are more comfortable to ride in than to walk. That playsuit is such a perfect pairing with your new wheels. What a darling outfit and bike! I think that 'scarf under your helmet' trick is such a good idea ~ helmet hair is the worst sometimes... :P I hate it when I pin curl my hair, then go riding! (> o <)! Absolutely gorgeous!! 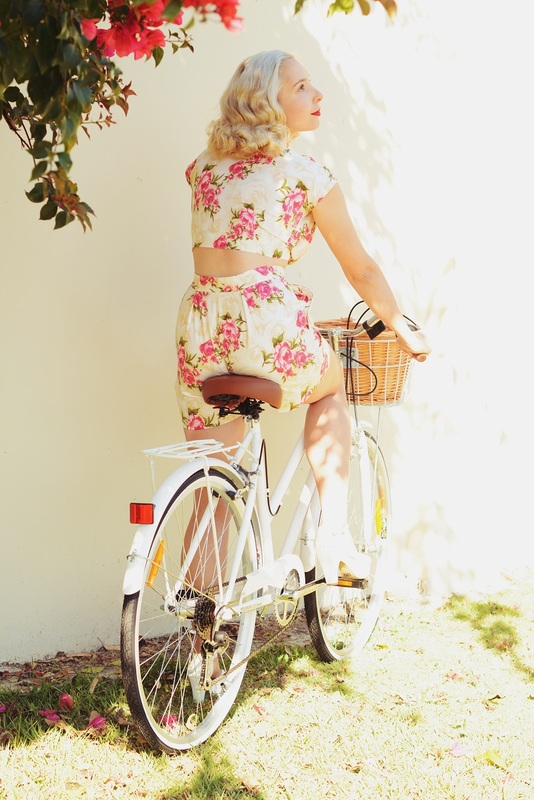 I love that bike and that romper is to die for!! Soooo immensely pretty! This is the perfect, romantic pinup girl-esque warm weather ensemble. You look enchantingly lovely, dear gal. Such a super cute look. This play suit is perfect on you! Love the pink. Hey doll!!! First off, LOVE your play suit!! I have a HUGE scar (battle wounds from cancer.) so wearing anything exposing my tummy is just NOT going to happen. But I could definitely wear this style. Can't wait to check out the maker. Also, at first glance I thought your bike was vintage. Its fabulous!! It was really nice to pop by & visit you again. Good luck with your wedding. I know you will be a beautiful bride. Everything about this is so gorgeous!!! I love your outfit and the white bike - you look absolutely perfect! And that's so sweet of your fiance to surprise you with it too. I LOVE that you're wearing heels while riding! So authentically vintage ;) if they could do it, we can do it! This playsuit looks like it was made for you - I love that it matches your bike!